Host a practice-specific webinar every day, covering everything from inquiry based learning to formative assessment. Co-host the #FlipgridFever Twitter chat on Tuesday, July 17th at 8p CT. Send everyone who gets Flipgrid Certified during the week a FREE STICKER PACK (just be sure to send over your mailing address when submitting your application)! Design Thinking, July 16, 2018 | 12:00 PM CDT: Students of the 21st century are problem finders & solvers! During this webinar we will explore how the design thinking process + Flipgrid can support creative problem solving. This webinar will feature special guests Nathan Lang-Raad of WeVideo & Nick Aguina, Local School Activator - Future Design School. Register here! Inquiry Based Learning, July 17, 2018 | 12:00 PM CDT: Discover how Flipgrid can be used in multiple subject areas to help students take leadership over their learning. This webinar will feature special guest Trevor MacKenzie, co-author of "Dive Into Inquiry" and "Inquiry Mindset". Register here! 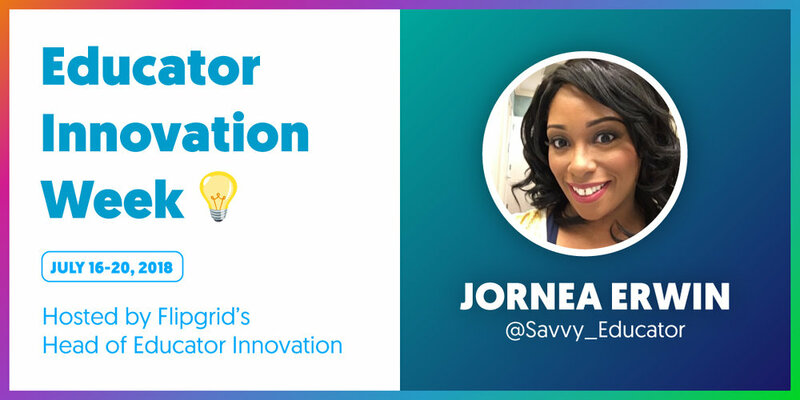 Power Up Learning Stations, July 18, 2018 | 12:00 PM CDT: Whether students are working on personalized goals or differentiated activities to foster growth, capture students understanding and allow their thinking to be visible with Flipgrid. Participants will leave with 10 ideas to power up learning stations with Flipgrid. This webinar will feature #StudentVoiceAmbassadors Joe Merrill, Kristin Merrill, Jessie Boyce & co-author of the Google Infused Classroom, Tanya Avrith Register here! Formative Assessment, July 19, 2018 | 12:00 PM CDT: Formative assessment helps us inform and guide instruction, and Flipgrid allows all voices to be heard. In this webinar we will explore unique ways you can supercharge formative assessment with Flipgrid. Register here! Creativity in the Classroom, July 20, 2018 | 12:00 PM CDT: Creating conducive learning environments includes honoring the creativity students bring with them in the classroom. During this webinar will we think outside of the box to discover ways Flipgrid can support creativity by increasing communication skills, encouraging collaboration, reducing anxiety, and enhancing critical thinking skills. This webinar will feature special guests Nathan Lang-Raad of WeVideo and Dee Lanier creator of SmashboardEdu. Register here! Not able to make it? Fear not! All of Jornea's sessions will be recorded and available here following the session. We hope you'll join us for some or all of Educator Innovation Week!